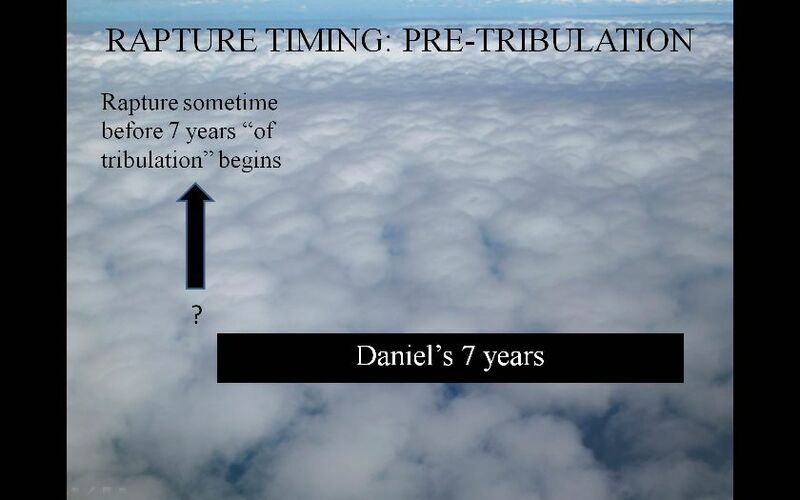 1) Pre-Tribulation – which is the belief that Jesus will come BEFORE the 70th week of Daniel, also known as the seven years of Tribulation, to rapture the Church. After the seven years of Tribulation, the Lord will return to the earth in the Second Advent with all His saints in Glory to set up His Kingdom on earth. 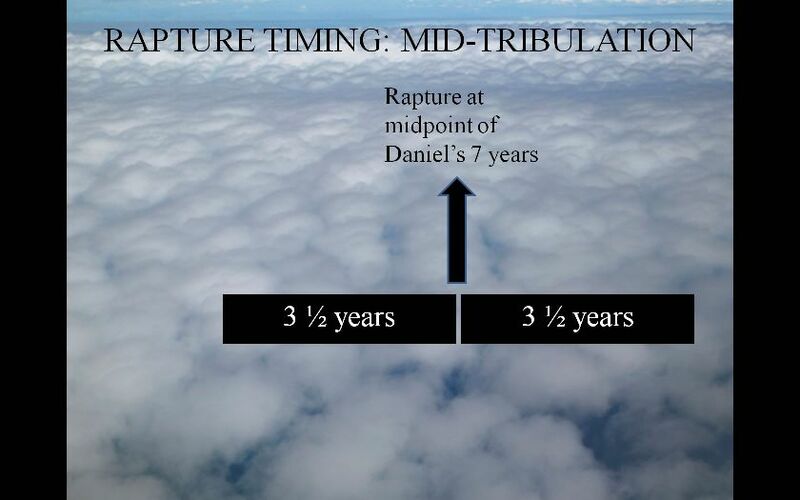 2) Mid-Tribulation – which believes that the rapture occurs EXACTLY HALF-WAY in the middle of the 7 years at the 3 ½ year mark. Also, instead of describing the Two Witnesses in Revelation as actual people, they are described as Israel and the Church; after their absence or death, their will be no more witnessing. During the first half of the Tribulation, the Church will experience the Antichrist’s wrath but then be raptured. The last half of the Tribulation will be God’s wrath on those remaining. 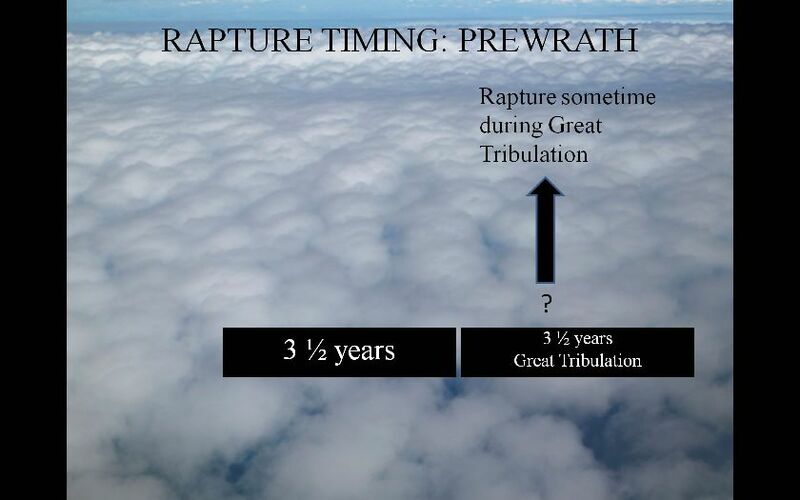 3) Post-Tribulation – says that the Church will endure “the entire seven years of tribulation.” The Rapture takes place at the same time as the Second Advent, the Judgment Seat of Christ, and the Marriage Supper of the Lamb which is AFTER the tribulation. 4) Pre-Wrath – the main tribulation is actually only the last half of Daniel’s 70th week = 3 ½ years. That 3 1/2 years is divided between the Antichrist’s wrath, which the Church will endure, and God’s wrath. So somewhere during the last 3 ½ years, before God’s wrath is poured out on mankind, the Church will leave in the Rapture (hence “Pre-Wrath” is talking about before God’s wrath). Exactly which day it occurs they do not know but they do know it is at the sixth seal which has the great signs in the sun and the moon and a great earthquake that shakes the entire earth. Pre-wrath is close to the belief I hold but not quite. I have what I call a modified Pre-Wrath/Post-Trib position. I believe both Pre-wrath and Post-Trib are true. Pre-wrath is true in the sense that Jesus comes at the Sixth Seal. Post-Trib is true in that Jesus comes at the Seventh Trumpet. The Seventh Trumpet is blown at the end of the Sixth Seal AFTER the Great Tribulation at which time the saints will be raptured. See my chart for a visual version of what I believe the Bible teaches concerning the end time. Each section below are the most famous rapture Scriptures that we will examine one at a time in context. The main Scripture is in the red and the supporting explanation and Scriptures are in the black below it. 1Th 4:13-18 KJV But I would not have you to be ignorant, brethren, concerning them which are asleep, that ye sorrow not, even as others which have no hope. (14) For if we believe that Jesus died and rose again, even so them also which sleep in Jesus will God bring with him. (15) For this we say unto you by the word of the Lord, that we which are alive and remain unto THE COMING OF THE LORD shall not prevent them which are asleep. (16) For the Lord himself shall descend from heaven with a shout, with the voice of the archangel, and with the trump of God: and the dead in Christ shall rise first: (17) Then we which are alive and remain shall be CAUGHT UP together with them in the clouds, to meet the Lord in the air: and so shall we ever be with the Lord. (18) Wherefore comfort one another with these words. 1Th 5:1-11 KJV But of the times and the seasons, brethren, ye have no need that I write unto you. (2) For yourselves know perfectly that THE DAY OF THE LORD so cometh as a thief in the night. (3) For when they shall say, Peace and safety; then sudden destruction cometh upon them, as travail upon a woman with child; and they shall not escape. (4) But ye, brethren, are not in darkness, that that day should overtake you as a thief. (5) Ye are all the children of light, and the children of the day: we are not of the night, nor of darkness. (6) Therefore let us not sleep, as do others; but let us watch and be sober. (7) For they that sleep sleep in the night; and they that be drunken are drunken in the night. (8) But let us, who are of the day, be sober, putting on the breastplate of faith and love; and for an helmet, the hope of salvation. (9) For God hath not appointed us to wrath , but to obtain salvation by our Lord Jesus Christ, (10) Who died for us, that, whether we wake or sleep, we should live together with him. (11) Wherefore comfort yourselves together , and edify one another, even as also ye do. Almost all agree that chapter 4 verses 16-18 are clearly talking about the rapture of the Church when the Lord Jesus will come from Heaven and gather all of His saints from the earth. However, the Bible was not written in chapter and verse so ignore that a new chapter was started and just keep reading. In context, Paul speaks of the rapture, the coming, and the Day of the Lord together like they are one event! Just read it all together. The only thought he interjects on the subject is that, concerning the times and seasons, it will come as a thief in the night. He NEVER changes subjects! He NEVER divided this into two events. The Day of the Lord (Jesus’s Coming) for “them” (the world) is taught “destruction” but for us he just gets through telling us that we will be raptured; for them it is “wrath” but for us it is “salvation”. There is not one shred of evidence that the rapture and the Day of the Lord (Jesus’ Coming) are completely separate events. If we apply normal Bible hermeneutics here, the context is that the rapture and the Day of the Lord are identical. We are raptured first and the Lord pours out His wrath afterward. The comfort is that we are not appointed to God’s wrath, NOT that we will avoid man’s persecution. That is truly comforting because God’s wrath far outweighs what the Antichrist will do in persecuting us. 1 Thessalonians 4 and 5 teaches us that the rapture happens, THEN the wrath of God is poured out on the sinners that remain. The two parts, the rapture and the Day of the Lord, are paired together here and are inseparable in this passage. The rapture seems to happen so fast that people do not have time to repent. Then many are destroyed which is why He warns them that it will come suddenly…too suddenly to react. The only questions here, what is the Day of the Lord? and does it start at the beginning of the 7 year Tribulation? If so, then Pre-tribulation doctrine is right. If not, then it is wrong. (I believe that the Day of the Lord does NOT start with the 7 years. But let us see what the Word says.) You can use the next list of verses all talking about the Day of the Lord to find out more about this event. What Is The Day of The Lord According To Scripture? The sixth seal, all agree, does not happen at the beginning of the seven years; it happens some time into the Great Tribulation. Therefore, the Rapture/Day of the Lord happens during the last half of Daniel’s seventieth week but we do not know exactly when. Christians will have to endure the persecution of the Antichrist. Don’t be deceived – be prepared! So what does the Scriptures teach us about the Day of The Lord? The Day of the Lord does NOT IN ANY POSSIBLE WAY start at the beginning of the 7 year “tribulation” period. The Day of the Lord starts with Him coming, first rapturing His people, then annihilating the heathen immediately and completely around Jerusalem. This happens at the end of the 7 years. It ends when He sets down on the Mount of Olives. He sets down after the last 7 vials of God’s wrath are poured out. If the pre-wrath conclusion about 1 Thess 4 & 5 is right, then the rapture happens (very quickly) then this destruction begins immediately afterward. Paul describes the entire thing as one event called “The Day of the Lord.” The Day of the Lord consists of the seventh seal, which IS the seventh trumpet, which consists of the seven vials. All of the above Scriptures either talk about rapture, the wrath of God known as The Day of The Lord, or both together. They are ONE event. The first Scriptures in 1 Thessalonians 4 and 5, shows that the rapture and the Day of the Lord are the same event. I’ll also be examining all the other major rapture Scriptures below. However, the Scriptures are very clear we cannot know the day or hour but we should be close to understanding the season it occurs. So the wrath?7 bowls will take one week,one month one year.Who are those who entre kingdom? The Bible does not exactly how long the bowls of wrath are but they appear to be very quick by the reading of the text. They could last 1 month or less by my estimate. They will not decimate all men on earth; most of the activity of the bowls will likely be centered around Israel, Europe, Russia, Asia, and North Africa. 1/3 of Israel will come out of the Great Tribulation and many millions of others from all around the world who will enter the Kingdom Age. Those judged by Jesus to enter in, will make it into the Kingdom. Read your Bible. Stop blaming the devil for God’s deliberate judgment. The 7 seals are the wrath of Satan and the 7 Trumpets handed out in Heaven and given to the 7 angels along with the Bowls are the wrath of God. The 5th seal is the killing of Christians. This is Satans wrath. Not God’s. The Trumpets and Bowls are God’s wrath on unbeliever’s. Ok? Revelations 11:3,11, clearly tells you the “Great Tribulation” is 3.5 years. Spells it right out.This is when the 2 witnesses are here. Read Rev. 6:17, For the Great Day of His wrath has come. This starts the wrath of God. You will not be here for this event. It begins by opening the 7th seal and then the 7 trumpets begin. People use the word “Tribulation” for the entire 7 year period and technically this is incorrect. The Great Tribulation is God pouring out his wrath not Satan as you claim but at least you don’t preach a false pre-trib rapture. Thanks for your comments. I agree that the 5th seal, as well as the four prior, are Satan’s wrath. But starting at the Sixth Seal, Jesus shows up with His wrath. Therefore, starting at the Sixth Seal is Jesus’/God’s wrath (Rev 6:15-17) which is the same event as Rev 11:8 and Rev 15:1, 6-7. If you believe the sixth seal and seventh seal is Satan’s wrath, what evidence in Scripture do you have to prove that? I apologize that some of my article was dated with a former way I used to believe and it was not corrected when you read it. Now I’ve corrected it. Also, you may not have seen the second page of this article because in it I agree with some of what you said. I’m so over joyed to see the true teaching of end times beginning to be more prevalent. I’ve been praying for Christians to open their eyes and see the false teaching of preeminence. There is one thing I would like you to consider concerning end time terminology. We need to stop referring to the 70th week of Daniel as the 7 year tribulation period. Jesus states in Matthew 24 that the Tribulation is not triggered until the Abomination of Desolation is set up when the Man of Lawlessness is revealed. He will demand to be worshiped as God in the temple of God. Many in Israel will refuse and flee to the wilderness of Edom where they will be protected and nourished for a times, time and half a time (3.5 years). Satan, the great red dragon, will be enraged that he cannot destroy the remnant (144,000 of the 12 tribes) so he goes to make ware with the rest of her offspring, those who hold the testimony of Jesus Christ. This is the Great Tribulation when the saints are given into the hand of the Beast for 3.5 years as stated in Daniel but noting that Christ will cut that time short for the sake of the elect. 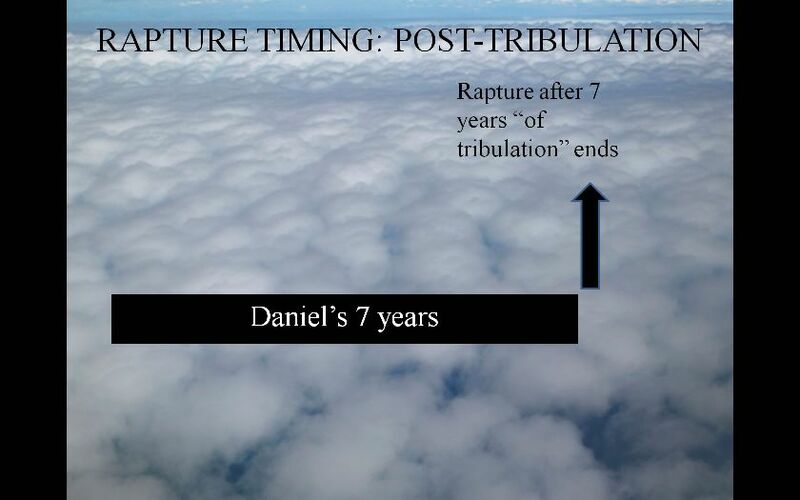 So, my point is that the Great Tribulation is not a 7 year period but the last 3.5 years of the 70th week of Daniel. So, the Great Tribulation is not the Wrath of God but the wrath of Satan unleashed on all who refuse to take his mark and worship him. It is Christ return at the opening of the 6th that cuts short the Great Tribulation before the end of the last 3.5 year period therefore it is the Lord’s wrath that cuts it short and being the resurrection and the rapture occur between the opening of the 6th and 7th seals (the 7th which triggers the actual pouring out of God’s wrath) it is evident that the true doctrine of the church not being destined for wrath is still maintained. Just as in the days of Noah and Lot so shall it be when the Son of Man returns. On THE DAY that Noah entered the ark the flood came and on THE DAY that Lot and his family were taken out of Sodom, by angels I have you, God’s wrath was poured down upon the city. So the the Resurrection, the Rapture and the day of God’s Wrath all happens on one day called the Day of the LORD. Again, I reiterate that we must not call the last 7 year period the Tribulation because the tribulation is only 3.5 years which are cut short and we must certainly not call it the time of God’s wrath because that just leads to confusion. We are not destined to wrath and if the church will be here during the 70th week of Daniel and it will endure the Great Trib it most certainly cannot be the time of God’s Wrath. Calling the Great Trib Satan’s wrath, the time when he pours out his wrath on all those who refuse to worship him, is most appropriate and is the truth of Scripture. Woe unto the inhabitants of the Earth for the devil has come down to you because he knows he has a short time.